SmartSMS enables you to send Picture Messages, Caller Group Graphic, Operator Logo, Ringtones and FlashSMS. FlashSMS is supported by almost ALL of the newer phones from Nokia, Philips, NEC, Siemens, Ericsson, Alcatel, Motorola and Sagem. Ringtones can now be sent to Nokia, Ericsson, Motorola, Sagem and EMS compatible phones. 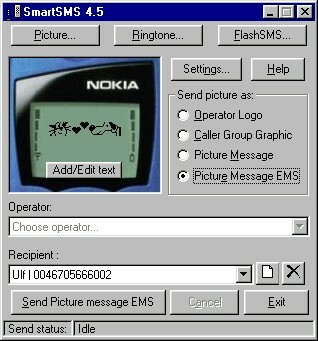 Caller Group Graphics and Operator Logos are supported by Nokia phones only. Magic Polyphonic Ringtone is a fast, fun, easy to use tool that helps you to create original ringtones for your mobile phone. Magic Wallpaper is a fast, easy to use and amusing tool that helps you to create original images for your mobile phone. With DJ ToneXpress you can create and send ringtones to your phone using any MP3 or WMA file from your music collection. The Ringtone Converter is a tool designed for both Microsoft Windows and Apple Mac systems that allows you to add new ringtones to your mobile phone without the need for cables or expensive premium rate SMS services. Logiccode SMS ActiveX Dll is a simple, powerful and easy to use ActiveX Control(Dll) that can be used to send text messages in English or in any other Unicode Supported languages like Hindi, Arabic, Chinese, German etc using GSM modems/mobile phones connected to serial/virtual serial port of a computer via data cable or bluetooth or infrared. Ubahr SMS is a useful tool which lets you type in text messages (SMS) and then send them through a mobile phone connected to your computer by IrDA, Bluetooth or cable - eliminating the annoyance of having to use your mobile phone's keypad.